The happily yellow sea sponge most often clad in his trademark brown square pants, white shirt and red tie may have begun his television career as Nickelodeon's "first low budget cartoon," but it's since become one of the channel's most watched series scoring viewers in all age demographics with its unique blend of child friendly animation mixed together alongside some surprisingly sophisticated humor. On one hand, it attracts legions of support from musicians ranging from Wilco to The Shins to Metallica to David Bowie to involving Oscar nominated and respected voice talent in some of the show's specials and its feature film debut. On another, it provides a refreshingly creative and nonsensical appeal of watching a show about a sponge who lives in a pineapple under the sea. And whatever the winning combination and its reasoning may be, former marine biologist turned animator and artist Stephen Hillenburg has managed to do the impossible. Namely, he's invented something that works as both a cult like show among hipsters and a kiddie favorite. Similar to the way that Sanrio's Hello Kitty is embraced by young girls to middle aged women-- something tells me we'll be seeing that yellow sponge (which would normally be tossed out in any kitchen in America) for quite a long time. Throughout its successful six award-winning seasons and media credibility bolstered by Time magazine's announcement that it was "one of the greatest television shows of all time," not to mention its popular series of spin-off individual DVDs, SpongeBob's fictional hometown of Bikini Bottom (itself "loosely based on Seattle, Washington") but "located at the bottom of the Pacific Ocean," has never run out of its share of adventure for the show's main ensemble. 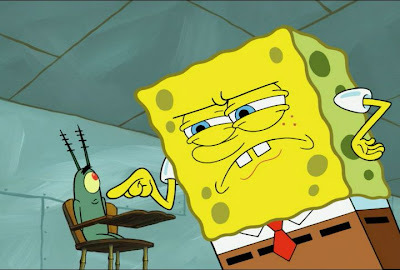 Although it centers on the Krusty Krab fast food cook SpongeBob, series regulars include: SpongeBob's extremely cheap boss Mr. Krabs; Krabs' nemesis Sheldon Plankton who runs the unsuccessful Chum Bucket which amazingly stays in business aside from never garnering any clientele; SpongeBob's pink starfish best friend Patrick; his Texan squirrel researcher pal Sandy; and neighbor Squidward Tentacles. Serving up seven episodes including one world premiere inclusion, SpongeBob Vs. The Big One is the newest Nickelodeon DVD from Paramount Home Entertainment which also released the channel's recent disc for its new Amy Poehler series The Mighty B! We Got the Bee one week earlier. 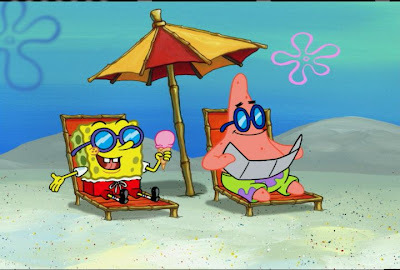 Kicking off The Big One with its titular episode; a heatwave has struck Bikini Bottom and after SpongeBob's shoes have melted off at work and they discover that Mr. Krabs hadn't paid the power bill that cuts off the air conditioning and ceiling fan, they hit the beach with the rest of the residents. However, instead of relaxing, Krabs puts them to work offering "free" Krabbie Patties for three bucks a piece before ultimately they're all separated and Krabs finds himself out in the distance alone in a place where jelly donuts rain from the sky and SpongeBob and Patrick become easily sucked into the surfer bum lifestyle. In a plot that will strike a familiar chord with those who have seen the imaginative animated feature Surf's Up, SpongeBob and Patrick must track down the illusive surfer guru Jack Kahuna Laguna (voiced by Johnny Depp) who-- in a strange combination of a Matthew McConaughey bongo playing hippie and odd wisdom espousing Mr. Miyagi-- advises them to "just keep breathin'" in order to catch the ultimate big wave which will return them back to Bikini Bottom. An obvious in-joke on McConaughey's recent Surfer, Dude and company "just keep livin'," the idea of living life to the fullest moves them from zen to extreme in the next episode as Patrick and SpongeBob misinterpret advice to be in the moment and start "Livin' Like Larry," to engage in painful and dangerous activities sending them where no sea creatures have gone before. In "Sun Blenched" and "No Nose Knows," we're presented with two of the best episodes on the disc that are thematically similar with the underlying moral to accept yourself for your own looks and try not to alter yourself for everyone else using the mishaps of the clueless Patrick as the unlikely lesson giver. 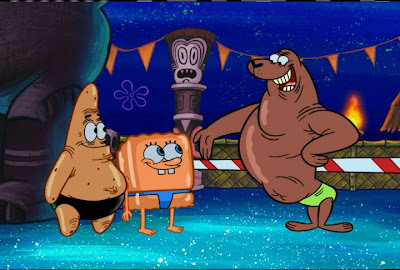 In the first, the gang tries first to become as tan as George Hamilton to attend a tan only party (a thinly disguised comment on both racism and sun damage) and then in the latter, Patrick has cosmetic surgery to give himself the nose he feels he always wanted, only to learn that having a nose means you have to smell things you sometimes wish you could ignore. 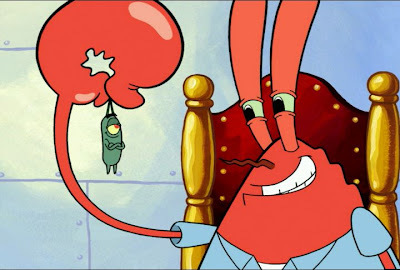 While "Giant Squidward" is a bit forgettable-- the final two episodes pick up the pace on the work front as the competition between Plankton and Mr. Krabs heats up when a secret ingredient disappears (turning SpongeBob into Columbo) and when-- in some odd Twilight Zone inspired piece of humor-- Plankton actually receives a regular and loyal customer to the Chum Bucket. And while definitely fans of the series will be sure to love its highly colorful transfer to DVD that also boasts Plankton's "Special Sinister" Commentary, a music video, all the while keeping its full screen format, Dolby Digital sound and closed captioning for the hearing impaired-- it's also engaging enough to amuse those unfamiliar with the show. Even though-- aside from an amusing Depp cameo-- the title episode and "Giant Squidward" are mostly unremarkable but you'll find yourself going for the other five far more often for repeat plays. Humorous, brightly drawn and despite its noticeable simplicity in a world where we're now spoiled with 3D and CGI-- there's still something instantly comforting and appealing about the lower budget hand-drawn show that's friendly and retro, augmented by its strong writing and ability to deliver jokes to all ages. This makes the fact that it's a Gen X phenomenon a no-brainer since stylistically, it's the type of animated fare we grew up with ourselves. Although I'm not sure how long the channel will continue airing the adventures of the sea sponge who lives in a pineapple under the sea-- SpongeBob's continued success during a time that finds similarly hand-drawn material becoming obsolete is a necessity. For, in a show that puts humor and story first instead of simply trying to tease with video game like spectacle, it makes the title of SpongeBob Vs. The Big One seem much timelier and filled with subtext in 2009-- one decade after the official premiere of the series as we know it kicked off. 1) "SpongeBob SquarePants vs. 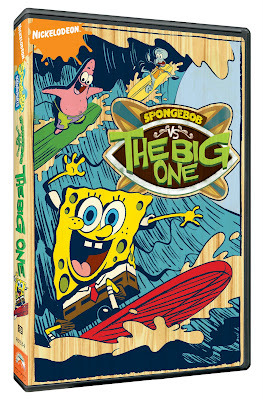 The Big One"
"Swept out to sea by a giant wave, SpongeBob and pals must learn to surf or be stranded on a remote island forever!" 2) "A Life in a Day"
"SpongeBob and Patrick add adventure to their dull lives by “livin’ like Larry.” And boy, does it hurt!" "SpongeBob and Patrick can’t attend the biggest party on Goo Lagoon because they aren’t tan…yet." "Squidward’s Kelp Grow garden spray makes everything it touches HUGE!" 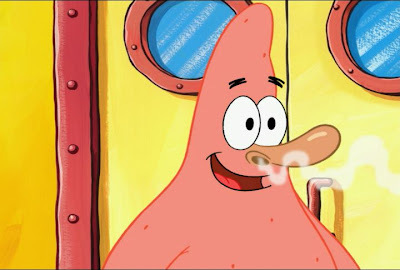 "Patrick returns from the surgeon with a nose and experiences the smell of stink." "SpongeBob and Patrick are on the case when the Krabby Party secret ingredient goes missing!" 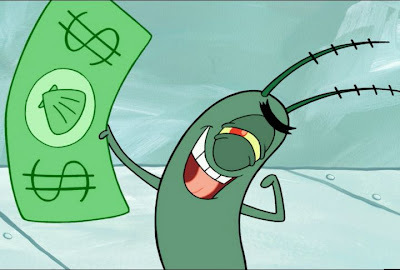 "Plankton has his first regular customer, but Mr. Krabs wants him at the Krusty Krab!"